Register Log In GliderCENTRAL Forums Housing & Accessories Dishes too deep? There arrived today, and I feel like they might be a bit too deep. They are 1.5 inches deep, and I've seen dishes that deep marketed for sugar gliders, but now I'm wondering if that isn't going to be a hassle for them, especially since the serving of HPW is shallow. I know from watching them with foraging toys that they can easily cling with their feet and eat with their hands, and go down headfirst into things, but would a shallow dish on the floor be more comfortable...? Do the dishes have any type of 'perch' or ledge on them? 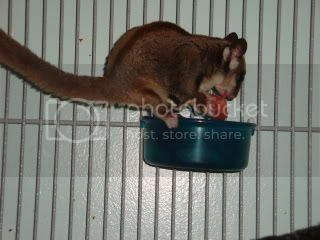 Gliders are resourceful - they will find a way to get to the food in the dish. I agree, I have used several style feeders. I've become a huge fan of water silos, I use them for water and liquid portion of diet (HPW), they work great, easy to clean. As for f/v combos, I've used crock styles on the floor in diners, and also a couple of styles that attach to cage walls. I liked the hooded ones, because I felt they kept the gliders out of the dish it's self, preventing waste matter from contaminating food, but then I thought my Ollie was getting too protective and switched back to the larger open style. I'm considering attempting the covered (hooded) ones again, and see what happens. Yiyo, no perch. Actually, it is a lot like Candy's second picture. It's probably fine, I just want them to be as comfortable as possible Then again, it's probably more similar to the wild for them to have to hang and eat, or perch on the rim. You can see from Candy's photos that they are successfully reaching their food. The silos I use are flat at the bottom, there is sometimes a small dried amount and sometimes there is actually a little liquid left over, I may sometimes add a little more than they need, or they don't always want to eat it all. The cage mount feeding cups could also be attached near the floor or if you have platform within cage, this way they can sit on the surface (floor) and reach up into their food dish. This is how I placed the covered feeders, and sometimes the open ones on/above floor or platform. I have used varied methods and placements, I never see them having a problem getting their food. You should be fine with what you have, but if you want to experiment, that's fine too. I know I sure have. Yes, again, I do know that they are able to get the food just fine, I wasn't worried about that. I might try putting them alongside the corner hammocks, though, thanks for the idea! My brats, if the dishes are near floor or just off a platform (any base they can sit or stand on and reach their food in the dish), will a lot of times grab a piece of food and just go sit around the area and eat it before going back for another piece of food. 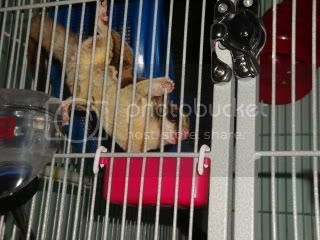 If just hanging randomly on cage wall, sometimes they will grab a piece and just hang upside down chowing down. There have been times I've hung the feeders near the top of cage, and several times seen my Lulu just hanging upside down from the cage roof, like a bat and eating away, lol. They really are a blast to watch.